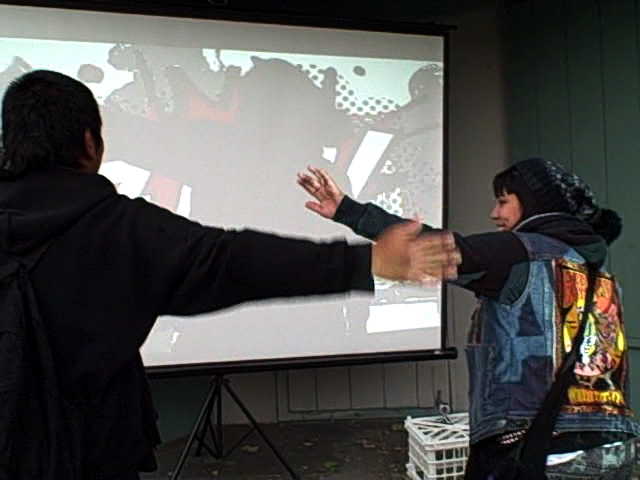 Spectacle and Lament is a real-time interactive video installation designed to engage onlookers in a public space. Large amounts of quick movements by viewers create classic comic denotations of action like ZAP! BAM! POW! 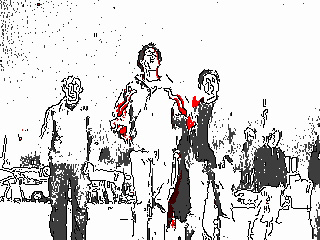 The participants see themselves represented in a dual-chromatic graphic novel theme consisting of a dark outline, a fill, and a single primary color. The work operates both as a comedic look at censorship nostalgia and as a critique of art itself as pure spectacle. Spectacle and Lament was commissioned by SLG Publishing for the 4th Annual SubZERO Festival in downtown San Jose. In creating this piece I had some set goals in mind. This is not unusual but normally my goals relate to what I want the audience to take away from the experience. However in this case the initial goals were aesthetic only. Primarily it had to be eye-catching and ideally it needed to draw some concept from comics. During development I began to wrestling with the fact that this was art designed to 'look cool'. But also with the fact that this is not at all uncommon. Thus the title of the piece is a direct reflection of my feelings during development and is only tangentially related to the finished work. Or How I created human comics. I started by designing strong dark outlines and a reductionist color pallet. In doing so, my aim was to create a mirror of the live world with aesthetics in the same vein as other comic referential material such as Sin City or Madworld. In this design scheme the landscape and characters are largely monochromatic with primary colors often reserved for highlighting elements of action such as gore or sound text. I wasn't going to have blood but I did want to make action visceral so opted to highlight areas of motion in bright red. The appearance of visual sound effects a la 1960s batman, was included as an end goal for the viewer, something to strive for. 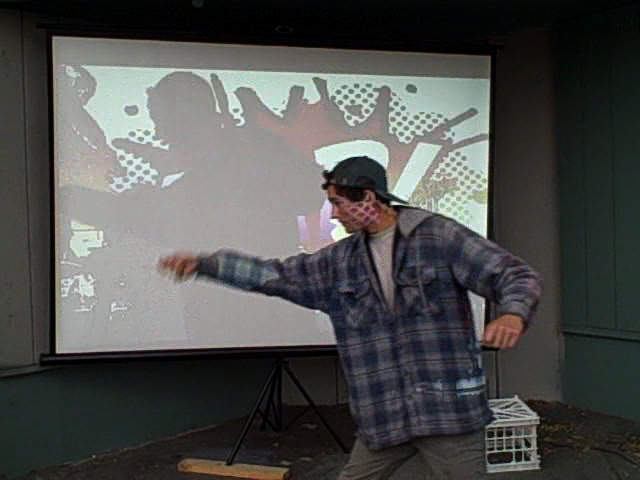 The combined animated visuals serve to reinforce and encourage movement on the part of the spectator, pulling them into active participant in the work. Spectacle and Lament was created in Max/MSP/Jitter. It incorporates a live video feed from a webcam placed below the screen. Motion is detected by measuring the weighted average of the change in pixel values between frames. Pixel changes are highlighted in red. The images, ZAP! BAM! POW! are displayed when the motion exceeds a certain numeric threshold. The specific image that is displayed is selected at random. Thanks for playing.